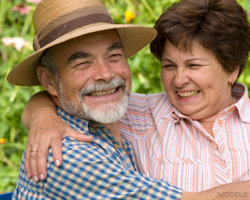 We regularly diagnose and treat age-related macular degeneration in Yuma, Arizona. More simply known as "AMD," this common condition is the leading cause of vision loss and blindness for those ages 65 and older, affecting more than 10 million Americans every year. It's important to know that steps can be taken to reduce the risk of blindness from AMD. While there is still no cure for the disease, knowing the facts greatly improve your probability of maintaining healthy vision. Request an appointment online or call (928) 782-1980 for an eye examination or to learn more. AMD is a common eye disease that gradually destroys the macula. The macula is the most sensitive part of the retina and is responsible for providing sharp central vision. If the macula is damaged, a person loses the ability to see clearly. There are 2 types of AMD: dry and wet. Dry AMD is the most common and is a result of light-sensitive cells in the macula slowly breaking down, gradually blurring vision. Wet AMD is less common, only occurring in about 10 percent of those who have AMD, and is more severe. Wet AMD happens when abnormal vessels behind the retina start to grow under the macula. These new vessels are fragile and leak blood and fluid, causing the macula to swell. Anyone over the age of 50 is at risk for AMD, but there are other risk factors to consider. Research shows that smokers are up to 4 times more likely to develop AMD than those who do not smoke. Non-smokers that live with smokers have almost double the risk. Caucasians are much more likely to develop AMD than people of African or Hispanic descent. People with a family history, too, are more likely to develop the disease. People with uncontrolled high blood pressure are also at risk. While there is no universal standard that dictates the frequency of eye exams, the bottom line is that the eyes can change very rapidly. With that in mind, eye exams should occur more frequently as people age. Dr. Aiello recommends that everyone have a complete dilated baseline eye exam with either an optometrist or ophthalmologist by age 40, and then every 2 years thereafter if everything is found to be normal. The earlier an eye condition is detected, the more likely its progression can be prevented or delayed. In order to diagnose AMD, an eye care specialist will, at a minimum, perform a visual acuity test and dilate your eyes so that he or she can look closely at the retina. In addition, your doctor may recommend other testing, such as photography or other high tech imaging devices. Tremendous new developments in diagnostic equipment are taking place as well, which allow for earlier and more accurate diagnosis. Unfortunately there may be few or no symptoms during the early stages of dry AMD, so it is important to be examined by an eye care provider early. In the early stages of wet AMD, straight lines may appear wavy and some may develop a "blind spot" resulting in the loss of central vision. During the later stages of dry AMD, the most common symptom is blurred vision and objects appearing dim. As always, prevention is the best medicine. As stated earlier, there is currently no cure for AMD but steps can certainly be taken to reduce the risk. Eating a diet filled with leafy green vegetables and fish can help lessen the risk of AMD. Eating foods high in zinc, vitamin C and E and beta-carotene has also been shown to slow the progression of AMD. In addition, avoiding foods and processed goods with a high-fat content can lessen the chance of plaque deposits in the macular vessels, which can hamper blood flow. Wet macular degeneration can cause rapid irreversible loss of vision. Luckily, there are exciting new treatments available. The most promising is an injectable medicine that reverses the growth of the new blood vessels in the macula responsible for vision loss. A healthier lifestyle can go a long way towards slowing the progression of AMD. Control your blood pressure, stay active and exercise regularly.